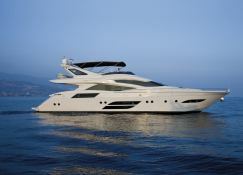 This Dominator 780 is available for charter in Olbia Marina, Sardinia. She offers a very spacious salon benefitting from large windows which were specially designed to maximize the space and offer spectacular views. The same principle applies to the Owner Cabin with its superb layout and large horizontal windows. 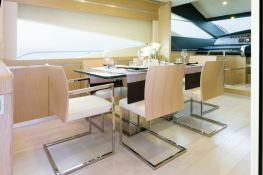 The flybridge is also an inviting and imposing space, as is the large salon which opens out to the canape, containing a dining table for 8. 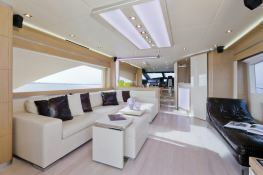 This Dominator 780 is available for yacht charter with a base price of 30 000 € (approximatly 33 833 $).